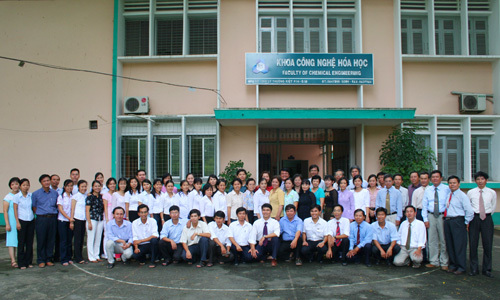 Founded in 1962, the Faculty of Chemical Engineering is a unique organization in the south of Vietnam that offers academic programs leading to the award of Bachelor of Engineering, Master of Engineering, or Doctor of Philosophy in Chemical Engineering, Food Technology, or Biotechnology. The faculty bears the missions of providing high-skilled professional human resource and transferring new technologies in the fields of chemical engineering, making great contributions to the modernization and industrialization in the South of Vietnam. More than 90 enthusiastic teaching staff of the faculty always do their best to complete the teaching mission excellently. Many research works have been carried out successfully and applied in the Mekong Delta region thanks to the effort of our experienced researchers and young active scientists. To meet the international standards, the faculty provides its students with professional training, hand-on lab work and field experience, as well as internship and opportunities to continue their higher education abroad due to the strong links with industry and a lot of prestigious universities in the world. Treatment of heavy metals, toxic agents in water effluent.